Published: May 1, 2015 at 12:06 a.m. Updated: May 1, 2015 at 01:21 a.m. 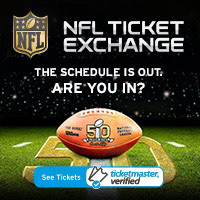 The history of the NFL is one of ebb and flow. Trends emerge and then slowly fall out of fashion. On Thursday night, we saw teams begin to recognize again that big-time running backs matter. The St. Louis Rams had Todd Gurley as the No. 1 overall player on their draft board, according to NFL Media's Albert Breer. They took him with the 10th overall pick despite drafting Tre Mason a year ago because Gurley can change their entire offense. The Rams suddenly have the most intriguing young backfield in the league to go with an outstanding defensive front seven. Until they can find their franchise quarterback, this is the next best route to keep everyone employed. San Diego has its starting quarterback in place, with Philip Rivers being told that he won't be traded. On Thursday night the Chargers made sure they had a three-down running back as well. San Diego gave up a fourth- and 2016 fifth-round pick to move up just two spots and draft running back Melvin Gordon. Unlike Ryan Mathews, Gordon can play all three downs. But he won't need to right away in San Diego, where Danny Woodhead is one of the best third-down backs in the league. This running back love started in free agency. LeSean McCoy got a huge contract upgrade when traded to the Bills. The Vikings bent over backwards to keep Adrian Peterson and still pay him quarterback-type money. Frank Gore got a nice contract despite being in his thirties. And DeMarco Murray got huge bucks from the Eagles. The NFL is still a passing league, but Thursday night was an indication that the running game is back in vogue in some NFL cities. 1. Tennessee fooled us. We thought the Titans might have been puffing up their interest in Marcus Mariota to inspire Godfather trade offers. It worked, but they wanted Mariota more than what was behind door No. 2. Despite Philadelphia and Cleveland sending aggressive offers to get to No. 2, the Titans became convinced that Mariota was the guy to save their franchise from annual boredom. Ken Whisenhunt said the plan will be for Mariota to start on Day 1. So the only thing they truly puffed up over the last few weeks was their love of Zach Mettenberger. 2. New York Jets and Cleveland Browns fans have suffered through a lot of rough draft moments. But they have to be thrilled with how Round 1 started. 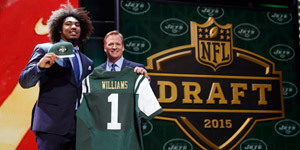 The Jets somehow landed Leonard Williams at No. 6 despite many analysts believing he's the best player in the draft. Their defensive line is scary with Muhammad Wilkerson, Sheldon Richardson, and "Snacks" Harrison to go with Williams. We love seeing teams that build strength on strength. New Jets coach Todd Bowles has to be thrilled. The Browns similarly stayed in their No. 12 spot and picked up a great value with defensive tackle Danny Shelton. He should immediately improve their sagging run defense. They might someday be relieved that any efforts to get Mariota or Sam Bradford fell through. 3. I can't remember being more excited about an offense than I am about the 2015 Indianapolis Colts. Adding speedster Phillip Dorsett makes their receiver group absolutely insane: T.Y. Hilton, Andre Johnson, Donte Moncrief, Dwayne Allen, Coby Fleener and Dorsett. Oh, and Frank Gore catching passes out of the backfield from Andrew Luck. Giddy up! 4. One of the biggest surprises of the night was seeing the Oakland Raiders pass on Leonard Williams. Their defense could have been scary, but they felt like Derek Carr needed a reliable weapon. They got one in Amari Cooper. 5. Good luck to new Minnesota Vikings cornerback Trae Waynes. He has to deal with the toughest wide receiver duos in the league in the NFC North. Chicago has a talented new duo in Kevin White and Alshon Jeffery. Waynes will also have to deal with Jordy Nelson and Randall Cobb in Green Bay, and Calvin Johnson and Golden Tate in Detroit. 6. Washington Redskins general manager Scot McCloughan is a man of conviction. Taking offensive lineman Brandon Scherff was bold and won't be particularly popular. 7. John Elway wasn't quite as aggressive in free agency this offseason, so he made a big splash in the draft. The Broncos' move up in the first round nabbed them a top-10 talent pass rusher in Shane Ray. Von Miller, DeMarcus Ware and Ray will form a scary group. 8. The Eagles might be disappointed that they didn't swing a big trade, but receiver Nelson Agholor is a perfect fit for their offense. We'll keep an eye on Philadelphia possibly moving veterans for more picks on Day 2. 9. The Steelers had to be thrilled that a top pass rusher (Bud Dupree) fell to them. General manager Kevin Colbert talked up the depth of this outside linebacker class, and they got a fun replacement for Jason Worilds.